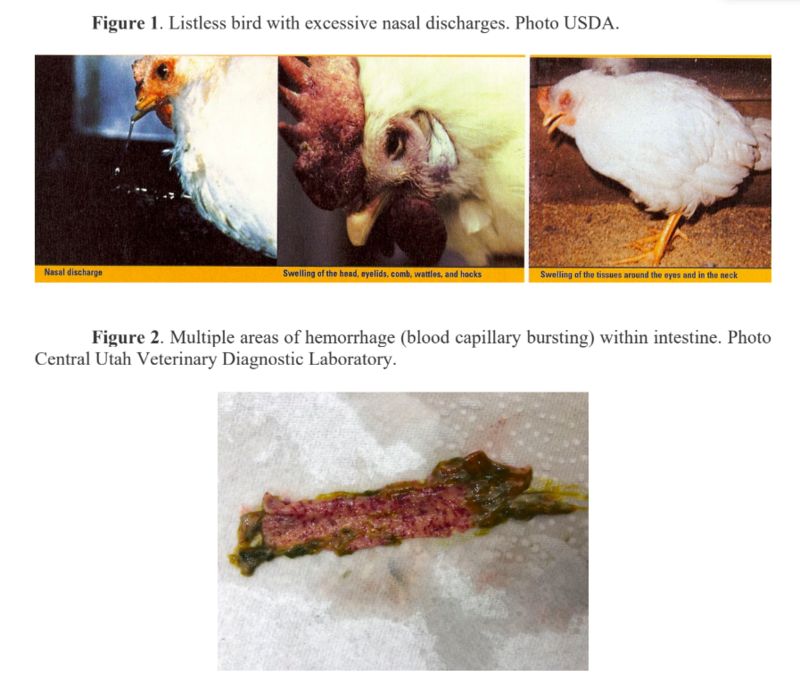 Virulent Newcastle disease (vND) is a contagious and fatal viral disease caused by avian paramyxovirus type 1 (APMV-1) that affects the respiratory, nervous, and digestive systems of birds and poultry. The disease is so virulent that many birds and poultry die without showing any clinical signs. Signs that may appear before death are often related to respiratory distress, such as excessive mucus dripping from nostrils and beak (Figure 1). Internally, there is extensive hemorrhage of the gastrointestinal tract and other organs (Figure 2). Because vND is categorized as a foreign animal disease, any significant outbreak in Utah would have a severe negative impact on the exhibition bird community by shutting down chicken shows and bird sales. However, there are no current restrictions on shows and auctions because there have been no further indications of spread. 1. Don’t go to live bird markets or swap meets where live birds are kept. 2. Change clothes and shoes and wash hands after visiting shows before you enter your home flock. 3. Don’t buy birds from non-reputable sources, and don’t sell birds you know are sick. 4. ALWAYS quarantine your chickens returning from a show for at least two weeks before putting them back with the general flock. The vND was brought into Utah by unauthorized methods. Do not let birds into shows by “unauthorized” methods. Assure every chicken entering the showroom at least appears healthy. Immediately refuse any bird that is hunched up, listless, or especially if it shows respiratory signs, such as sneezing, mucus in nostrils, coughing, etc. Any chicken entering a Utah show from out-of-state should be able to present either NPIP certification (VS Form 9-3) or a health certificate plus documentation it has tested negative for Pullorum/Typhoid within the last 30 days. Please call the State Veterinarian’s Office for specific instructions. If you have any questions, please do not hesitate to call me (435.851.2233).